A thrilling, choice-based adventure in which players seemingly become part of the experiment! Zoe Trapp is an interactive thriller involving a genetic enhancement advisor who doubles as a corporate spy hoping to expose secret experiments performed by her employer, Life Identical. This immersive experience uses personalization, email, text messages, social networks, video, images, badges, puzzle solving, and phone calls — all within Conducttr Communicator. 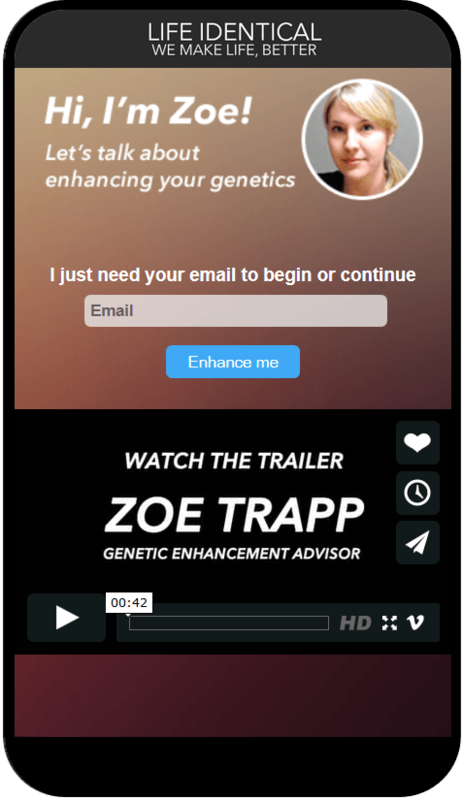 Zoe interactively screens players using video or text messages to see if they’re eligible for DNA upgrades. The sooner a player expresses skepticism about these dubious enhancements, the more quickly Zoe confides that she’s gathering evidence to prove Life Identical is cloning humans to be used as disposable test subjects. It’s dangerous and difficult to gather evidence so Zoe needs someone on the outside who can keep it safe in the event something happens to her. Evidence includes media such as cardboard camera photos, sketches of clone pods, and Zoe’s video diaries. In the course of helping Zoe uncover her most important piece of evidence, players send Zoe their own theories, go up against Life Identical employees, hack into a secure area, and (hopefully) defuse a bomb. Since there are multiple choose-your-own-adventure paths, players might also call an undercover detective who reveals a double-cross that directly affects Zoe’s safety. Story progress is encouraged by awarding badges and building an ever-expanding evidence file that displays all of the media assets sent by Zoe. Using only unpaid social media channels for promotion, Zoe Trapp received almost 50,000 interactions in the first two weeks. Activity in Conducttr led directly to an increase in the number of downloads of the Phrenic iOS app and visits to Phrenic’s website–even though the Zoe Trapp experience never references Phrenic. Engagement extended beyond Conducttr Communicator, including players who blogged about their experience or who had conversations with @ZoeTrapp on Twitter. Based on this positive audience reaction, a new chapter is being developed and a site was created to enable anyone to submit their own evidence or stories about cloning or Zoe Trapp. Phrenic is an independent transmedia universe made of short films, fiction, interactive stories, alternate reality games, and user generated content. Mike Vogel was looking for a way to create an interactive story that didn’t require programming knowledge but could provide a game-like experience to introduce key Phrenic characters and themes to a new audience.